TOKYO – Two sushi bar owners paid more than $100,000 for a Japanese bluefin tuna at a Tokyo fish auction Monday, several times the average price and the highest in nearly a decade, market officials said. Yoshida said the extravagant purchase — about $370 per pound ($817 per kilogram) — went to a Hong Kong sushi bar owner and his Japanese competitor who reached a peaceful settlement to share the big fish. The Hong Kong buyer also paid the highest price at last year's new year event at Tokyo's Tsukiji market, the world's largest fish seller, which holds near-daily auctions. A slightly bigger imported bluefin caught off the eastern United States sold for 1.42 million yen ($15,400) in Monday's auction. "It was the best tuna of the day, but the price shot up because of the shortage of domestic bluefin," Yoshida said, citing rough weather at the end of December. 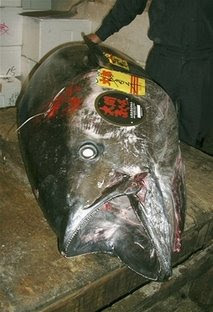 Buyers vied for only three Oma bluefin tuna Monday, compared to 41 last year. Typical tuna prices at Tokyo fish markets are less than $25 per pound ($55 per kilogram). But bluefin tuna is considered by gourmets to be the best, and when sliced up into small pieces and served on rice it goes for very high prices in restaurants. Premium fish — sometimes sliced up while the customers watch — also have advertising value, underscoring a restaurant's quality, like a rare wine. Due to growing concerns over the impact of commercial fishing on the bluefin variety's survival, members of international tuna conservation organizations, including Japan, have agreed to cut their bluefin catch quota for 2009 by 20 percent to 22,000 tons.